After their big defeat at the hands of Salford in their opening Qualifiers fixture, Hull KR went to Toronto and got the win to revitalise their campaign to retain their Super League place. But today they had the biggest of tests as they visited the tournaments favourites with a trip to Headingley to take on the Leeds Rhinos. Danny McGuire was making his first playing return to the ground where he won so many honours, this time with the intention of spoiling the Rhinos party and boosting his new side chances. He was joined by a handful of ex-Rhinos against a still injury ravaged home side. It was the most appetising Qualifiers game of the weekend in a third round of great looking fixtures. Joel Moon scored the Rhinos opener with just over three minutes on the clock as took a pass wide on the left wing and dived for the line to ground before being pushed into touch. Liam Sutcliffe was unable to add the touchline conversion. Craig Hall levelled the scores on ten minutes after Luke Briscoe passed to no-one and he picked up the loose ball to evade a couple of attempted Leeds tacklers to run the angle and score. Old timer Danny Tickle was unable to add the two. Three minutes later Scott Quinlan scampered over for KR’s second after he took a Chris Atkin chip over the top to run twenty metres to score with little Rhinos defensive resistance. Tickle again missed the conversion but the visitors were 8-4 ahead. Carl Ablett was helped from the field on twenty-two with a knee injury and replaced by Anthony Mullally. 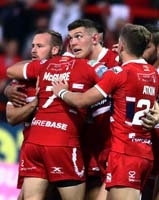 Hull KR then scored a well worked length of the field try when Robbie Mulhern was on hand to complete a Crooks break and run the last twenty-five to score. Craig Hall added the extras two for a 14-4 lead, the Rhinos defence with a few questions to answer. On twenty-eight the Rhinos got back into it when Luke Briscoe collected a knocked-down ball to weave his way past the Robins tacklers to score from twenty. Sutcliffe added the extras to narrow the arrears to four points. Stevie Ward conceded a fifth tackle penalty thirty from his own line and Craig Hall kicked the two for 16-10. A brilliant Sutcliffe interception and eighty metre break saw him hauled down twenty out but a fast play the ball saw Richie Myler step out of the attempted tackles to dive over by the left upright. Sutcliffe added the extra two to level the scores with just a minute to the interval. Nathan Peteru scored with seconds remaining after he jinked through the broken KR defence to regain the Rhinos lead, and when Sutcliffe added the extras it was the Rhinos who went into the break with a 22-16 lead in a game which had looked as though it was slipping away from them early on. Liam Sutcliffe kicked a forty-second minute penalty to give the Rhinos an eight point lead after Mose Masoe had interfered at the play the ball. On forty-five Rovers fired back into the game as Craig Hall sprinted down the right touchline to score a twenty metre try in the corner. Hall pushed his conversion attempt in front of the uprights. Three minutes later and Craig Hall got his hat-trick when a Danny McGuire kick to the corner caused havoc in the Leeds defence as they jumped to take a high kick and as the ball went to ground Hall pounced first to ground. Hall added the extras and KR were back ahead at 26-24 with half an hour remaining. On fifty-one the Rhinos were back in the lead when Jordan Thompson bust the line and found Matt Parcell in support to go over from twenty metres out to score by the uprights. Sutcliffe slotted over the extras for 30-26. The game was turning into a classic between two evenly matched sides. Two minutes later the Rhinos extended their lead to ten points after a great passing move over seventy metres ended with Tom Briscoe rolling over the line by the right upright to give Sutcliffe a simple conversion for 36-26. A magnificent fifty metre Adam Quinlan break saw him to the Rhinos twenty where he found Chris Atkin in support to go the last thirty to dive over and score as the Rhinos failed to get back to cover. Hall added the conversion and as KR launched yet another fightback they were just four behind their hosts. Taioalo Vaivai performed a miracle on sixty-seven when he pushed over the top of three Rhinos defenders to ground the ball when he should really have been held up. Hall added the goal and it was, once again, Rovers turn to hold the lead with just over ten minutes remaining. Brad Dwyer picked up the ball in an offside position on seventy-seven and on the last of the resulting set Danny McGuire lost the ball in the act of scoring. But it didn’t matter, KR defended the last tackle to take the crucial win by a two point margin. Whilst this was a fantastically entertaining game in terms of the tries scored and the number of times that the lead changes hands the quality of the rugby was questionable. Despite the Rhinos best efforts, KR would just not lie down when they went behind and they fought back brilliantly on several occasions to secure a crucial victory and push the Rhinos if not into the ‘danger’ zone, at least into the ‘feeling a bit uncomfortable’ area. Rhinos: Walker, Briscoe T (T), Ward, Moon (T), Briscoe L (T), Sutcliffe (6G), Myler (T), Singleton, Dwyer, Cuthbertson, Ablett, Ferres, Parcell. Subs: Mullally, Thompson (T), Jones-Buchanan, Peteru (T). KR: Quinlan (T), Hall (3T, 5G), Crooks, Vaivai (T), Carney, McGuire, Atkin (T), Masoe, Lee, Mulhern (T), Tickle, Greenwood, Clarkson. Subs: Scruton, Lunt, Blair, Kavanagh.